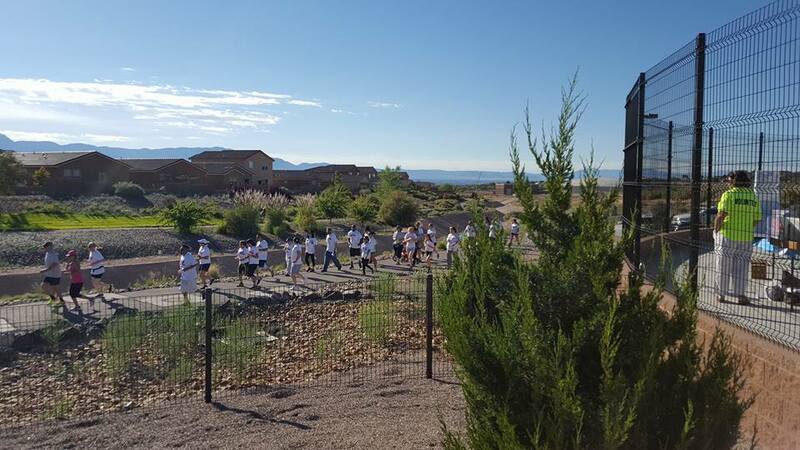 A Run Above will take place in Rio Rancho at the beautiful A Park Above and the adjoining Linear Park Trail. Please support this fundraiser of the A Park Above Foundation. 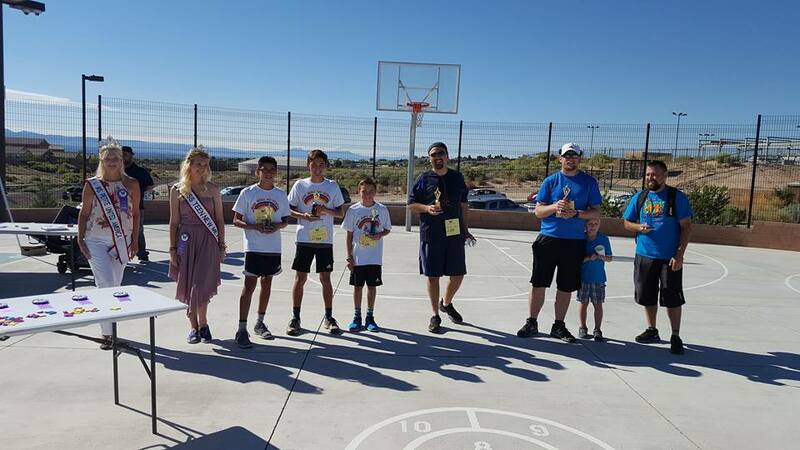 Our Foundation works in conjunction with the Rio Rancho Parks and Recreation Department to maintain and improve A Park Above, the winner of the 2016 “Best of City Park” by the Albuquerque Magazine. This is a unique park that was created through the efforts of community, city, and state funds and donations to provide a park that is all-inclusive - where the play equipment is designed for ANY person with ANY ability! 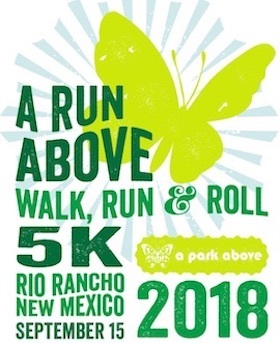 For further information about “A Park Above” visit our website at aparkabove.org or the City of Rio Rancho Park and Recreation Department’s informational page at rrnm.gov/2710/A-Park-Above. 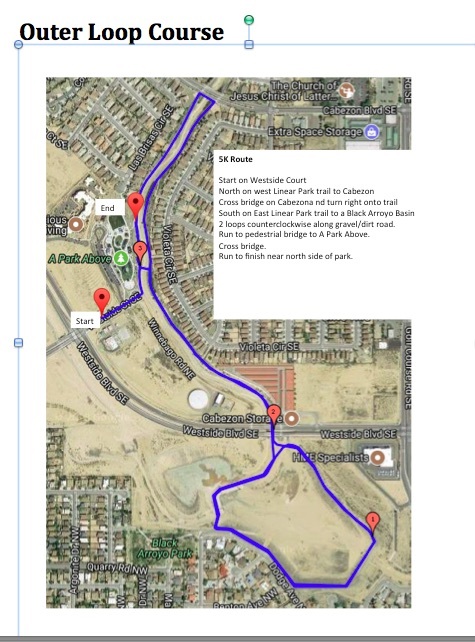 Outer Loop:The Outer Course uses the Linear Trail and goes down to the Black Arroyo. It will be measured to USTAF standards but because it is partly dirt it cannot be a certified course. Inner Loop: The Inner Loop is our course that will be fully accessible. 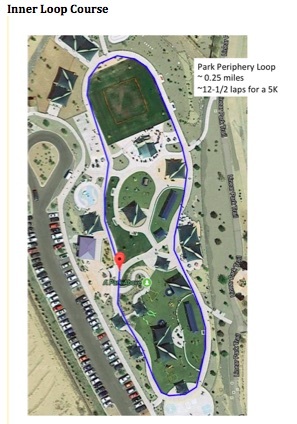 It will take place inside the park itself consisting of 12 loops on the concrete sidewalk. It will be a certified USTAF course. Online Registration will be open on active.com until Sept 12, 2018. Race Day registration will be open from 8:00am-9:30am at the Registration Table at A Park Above. Please park in designated areas only. Parking attendants will help assist with parking options. ADA approved bathrooms are located within A Park Above. The start of the race is within A Park Above. There will be a gun start and a computer timed finish. Participants will receive a bib number with a chipped timing device in their Packet that must be worn on race day. Your bib number must be visible and worn on the front outside of all clothing during the entire race so that it may be clearly seen. Bib numbers are nontransferable and MUST be worn by the runner to whom it is assigned. For everyone’s safety inline skates, motorized scooters, bicycles, skateboards, and animals of any kind (except for Certified Service Animals) are prohibited from the course. Strollers and baby joggers must start at the back of the pack and your child must be secured in the stroller at all times. Those using strollers and baby joggers may want to choose the fully paved course. There will be no refunds or transfer of registration. Weather forecasts will be monitored prior to the event paying special attention to the possibility of heavy rain, thunder and lightning, high winds and extreme temperatures. If necessary, athletes will be made aware of these predictions by email so that participants can properly prepare for severe weather during the race, or possible race delays or cancellation. The Race Director will monitor the weather and make a decision if any action will be taken to modify the race. A first aid station will be on site with a nurse practitioner to assist you at any time. Radio communication personnel will be positioned at every water station along the course. The award winners will be announced at the Awards Ceremony for each course. Age group prizes will be given for both the Outer and Inner Loop Courses to the top three male and female finishers in the following categories: 11 years & under and 12 years & older. Post race refreshments and food vendors will be located near the finish within A Park Above. Results will be posted immediately after the event near the finish as well as online at aparkabove.com. Decide where your family and friends can cheer you on when you most need the support. There will be water stations along the course. Volunteers are still needed to help! Please contact A Park Above Foundation at info@aparkabove if you would like to volunteer to help on race day.